For Damon Severson, absence makes the heart grows fonder. 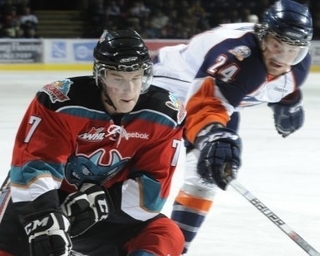 The Melville, Sask., native's progress this season with the Kelowna Rockets has been slowed by a wrist injury that caused him to miss six weeks of the season. Now that he's back in the lineup, it's allowed Severson to get re-energized as he vies to make strides in his game. The home stretch has great worth to a player in his situation as someone on the bubble as a possible second- to fourth-round pick. "Once you get away from something for a while, you definitely do appreciate it a lot more," says the 6-foot-1, 200-pound Severson, who was 46th in NHL Central Scouting's North American midterm rankings. "Hockey's a gift that I'm blessed with. "The bag skates were getting old," he adds. "The team would be on the road and I'd be here in Kelowna skating alone. I was just excited to get back and be playing with the guys." Severson had only been back three games before being one of two Rockets to represent the host team at the CHL/NHL Top Prospects Game two weeks ago ("it made it 10 times better to play in it in front of my home fans, in my home arena'). He was among the early-season leaders in defenceman scoring in the WHL before getting hurt in December. Of course, he doesn't project as an offensive defenceman, but as someone who will learn to used his good-sized frame effectively and be able to chip in occasionally on offensive end. By his own assessment he was "a little bit soft" as a rookie last season, although that could be somewhat understood since he only turned 16 a month before the season. The Rockets' defence corps is fairly young, with only one 19-year-old. That means there is ample opportunity for Severson to showcase his assets over the home stretch. "I felt like this year I had to bring a little more presence on the ice with my body and be more physical," he says. 1. Whom in the NHL do you watch closely and think, "I need to play like him" or "I see things in his game that I need to blend into mine?" "For sure, ex-Rockets Shea Weber and Duncan Keith. Shea Weber, he's got big body presence and he likes to hit I felt like last year I was a little bit soft in my own end and a little bit soft on the ice. I felt like this year I had to bring a little more presence on the ice with my body and be more physical." 2. You were a pretty fair baseball player as a youth. Why did you ultimately pursue hockey? "I found I had more passion for hockey. Baseball in my hometown obviously isn't the biggest thing. It's definitely one of the things that's second to hockey. But it's one of my pastimes." (How did the two sports complement each other?) "Hand-eye coordination is one thing and speed is another thing. Baseball, you got to be quick in everything you do. Catching helped me a lot. You have to jump up on every pitch." 3. Outside of family, who has had the greatest impact on you in hockey? "It's hard to say other than parents and family. I just got to say coaches, they've pushed me all through the way. I got a great head coach here in [Rockets bench boss] Ryan Huska and the defence coach being Dan Lambert here. They've pushed me and they want me to be the best I can be ... They let me know if I'm not playing my best." 4. What do you consider your proudest hockey achievement? "Just being named to this event [CHL/NHL Top Prospects Game]. Also, when I was in peewee and bantam I won provincial and league championships both years. You have those trophies for the rest of the life, you have memories that last a lifetime." 5. Since you're in the B.C. Division of the WHL where there is a lot of travel, one has to ask: what is the worst movie you've watched on the team bus? "Lots of guys on the team are kind of Trailer Park Boys fans, but I don't know about that." Neate Sager is a writer for Yahoo! Canada Sports. Contact him at neatesager@yahoo.ca and follow him on Twitter @neatebuzzthenet (photo: WHL).